The best performance you can ask for. It�s what you not only want, but also expect from a battery. It doesn�t matter if you�re working, driving cross-country, off roading or just having fun. If you're looking for pure power, reliability, and endurance look no further. Optima Batteries deliver time and time again. Optima's unique technology, known as SpiralCell Technology, gives Optima Batteries over 15 times more vibration resistance and increased cycle life compared to traditional batteries. They�re virtually spillproof and maintenance-free for absolute peace of mind. Simply put, they are a step above the rest. Optima Yellow Top Batteries are a great addition to your vehicle. With premium cranking power and an impressive cycling capability, it�s perfect for modern accessory-loaded vehicles that are pushed to the max. The Optima Yellow Top Battery can repeatedly be brought back from deep power drains to a full charge, so it can power plenty of electronics and still start you up time after time. Low internal resistance also provides more consistent power output and faster recharges. This makes Optima YellowTop Batteries ideal for trucks with winches, vehicles with high-demand electronics and aftermarket audio systems, commercial vehicles and heavy equipment. 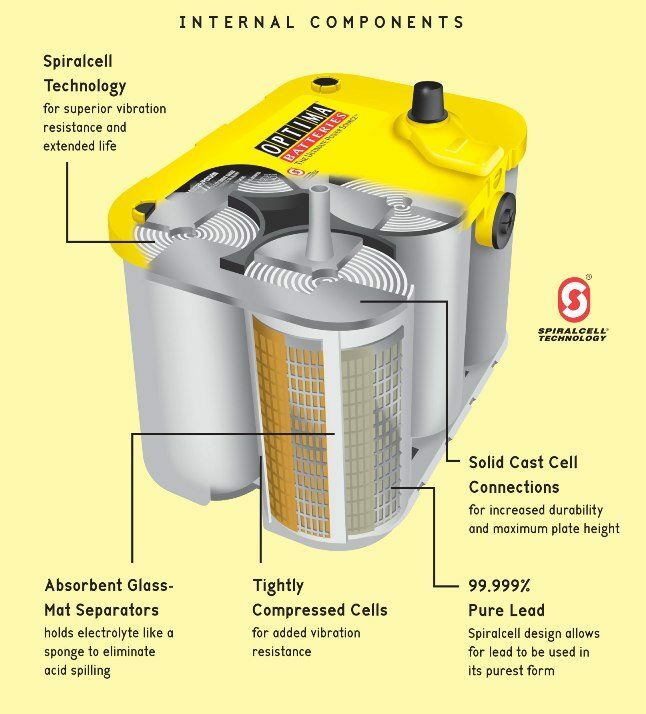 They can all rely on the YellowTop battery to provide ultimate starting and deep-cycle power.